If you use Canvas LMS and VETtrak, we are excited to announce that the VETtrak recent major software update, 17.2 is now fully integrated with Canvas. This integration is available to Enterprise and Enterprise Plus customers by request. 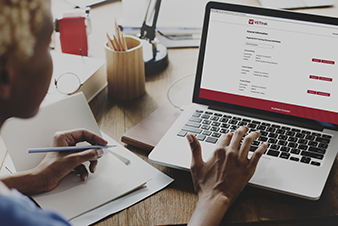 If you have a Canvas LMS account, simply email support@vettrak.com.au requesting the Canvas LMS feature be turned on in your VETtrak instance if you already have a Canvas account. Once this feature has been activated, you will need to update your VETtrak Registration Key. This update will trigger new menus and wizards to be available in your VETtrak software. The VETtrak Development team hosted a webinar in July discussing the VETtrak integration with Canvas LMS, you can watch the recording of the webinar here (requires Support Centre login). A brief summary of the webinar notes can be found below. The course in Canvas LMS will need to have a Section with the VETtrak occurrence ID set as the SIS ID. The Canvas LMS will also need modules that are going to map to the VETtrak units and/or tasks, and the required assessments the student will complete. Once the occurrence ID has been set to the Canvas section SIS ID, the occurrence needs to be linked to the Canvas section. VETtrak will link the Canvas section with the corresponding occurrence ID and return the list of modules to be mapped. Each of the Canvas modules can be linked to units and tasks that are in the occurrence. If you require a Canvas module to link to multiple units, then tasks should be used, and the task matrix for the occurrences set up to start/complete multiple units for a task. The next step is to transfer the enrolments in the occurrence to the Canvas LMS. This will enrol the students in the linked section of the Canvas course. Once the occurrence is linked, a new right-click menu on the Enrolments node is now available of Transfer enrolments to Canvas LMS…. Select the students to transfer and click Next & Finish. When the student starts an assessment task in Canvas, the status of that ‘started’ assessment can be retrieved by VETtrak. If the assessment has started in Canvas, on transfer to VETtrak, the user will need to populate the start date as this currently can’t be retrieved from Canvas. There are several options to use. The transferred results can be adjusted at this point before saving them. This will retrieve all results from Canvas across all course sections for processing. This option can take some time to run.